A new role model for Chris Paul? Chris Paul is playing a different brand of basketball since his knee injury. 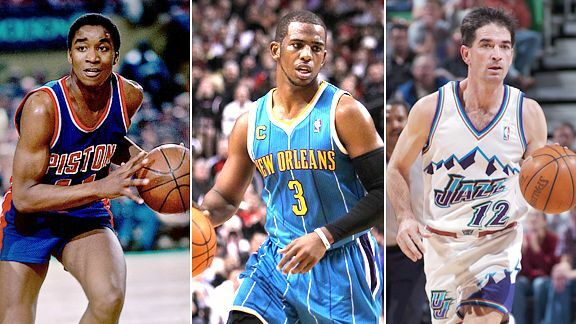 At the tender age of 25, Chris Paul is not what he once was. Now, before you freak out, let's consider what he has been. He's already been an MVP runner-up, a three-time All-Star, an All-NBA first- and second-teamer, and (but for fans of Deron Williams, Rajon Rondo, Steve Nash and now Derrick Rose) the league's best point guard since he came into the league. This season he is among the league leaders in PER, double-doubles, steals, assists, free throw percentage, 3-point shooting and assist-to-turnover ratio. For most of the season, he has looked like a prime MVP candidate. But the Hornets have won only three games in the past month, and I've started to worry about CP3. No, I'm not worried about his visit to New York on Wednesday and what it means for his future in New Orleans -- that's too distant a concern. Instead, I spend my time worrying about the meniscus tear he suffered in his left knee about 13 months ago, on Jan. 28, 2010. The surgery was shortly thereafter. The rehab, it appears, will go on for the rest of his life. Among the side effects, tragically: Paul has lost one of his best weapons, the explosive first step he once used to beat any player to any spot on the floor. Paul generally refuses to discuss his physical ailments, but he has talked about the knee injury in vague terms lately. On Jan. 29, he told the New Orleans Times-Picayune that he is "on it every day. I'm still strengthening it, trying to get it as strong as possible. At some point, it'll be where I need it to be." At the All-Star Game last month, he said, "As I get older and older, I'll probably slow down a little bit more. I probably won't jump as high. Hopefully I just keep getting better in basketball. Just continue to work on ballhandling and shooting." So what does it mean? Whereas Paul was once on track to be Isiah Thomas 2.0, he has become something else entirely without that lightning first step. It might be time for a new comparison: Paul has become John Stockton 2.0. Paul was never just an athlete. To go with the blazing speed, he had an incomparable handle, court vision and basketball smarts reinforced by one of the most competitive and ruthless on-court personalities in the league. He's still quick, elusive and able to free himself and his teammates for baskets, but these days, his play in the half court is almost entirely reliant on misdirection and clever ballhandling. He goes to the basket less, but compensates by shooting at a better clip than ever before. With his strength and low center of gravity intact, he often relies on running into opposing players to force them to retreat and give him room to shoot. Or he forces the contact and draw fouls. OK, I'll admit it. He flops. A lot. Regardless, it has been an amazing transformation over the course of less than a year. As he's encountered new limitations, he has shifted his focus to being the best floor general he can be. Throughout his career, CP3 has been the subject of a fierce debate regarding who is the better point guard, he or longtime Utah Jazz point man Deron Williams, now plying his trade in Newark, N.J. In the 2005 draft, Williams went one spot ahead of Paul, and he holds the better head-to-head record, while Paul has generally put up better overall numbers and been more decorated with leaguewide honors over the years. In this debate, Paul was usually considered the speedy creator who thrived because he was untethered from obligation to run a rigid offensive system, while Williams was often believed to be constrained by Jazz coach Jerry Sloan's scripted flex offense. But the script has flipped now. These days, it's the Utah point guard of yesteryear who comes to mind when I watch Paul play. And while it's hardly what I expected, the similarities have become striking. Like Paul, Stockton directed his team's offensive system almost to a fault, ignoring open shots early in the shot clock to keep trying to generate open shots for his teammates. When fans want CP3 to take the open 3, he's waiting for power forward David West to pop open for a short jumper -- Stockton had Karl Malone in that role. Paul is the current master thief, while Stockton holds the all-time record with 3,265 steals, far ahead of No. 2 Michael Jordan. In addition to great anticipation, Paul and Stockton have shown a masterful understanding of opposing offensive schemes. And each in his own way, Paul and Stockton have been known for gritty, sometimes physical play, to the point of being accused of dirty play to stymie opponents and gain an advantage. After noticing this tendency and drafting this article, I contacted Kevin Pelton of Basketball Prospectus and ESPN.com, who has a statistical system that identifies similar players. Pelton usually runs it for three seasons of a player's career at a time, but at my request, he examined Paul just this season, since his injury. And when Pelton ran the numbers, who did his computer cough up as the player most similar to the current Chris Paul? John Stockton. Is it a perfect comparison? Paul turns the ball over less and rebounds far more. He also harps at referees all game while Stockton was known for his hardwood stoicism. As for Stockton's freakish hand size and short shorts, Paul isn't even in the same league. And on his best nights, CP3 reminds us of those electrifying days from earlier in his career and the early part of the 2009-10 season. We Hornets fans harbor a secret wish for him to explode as the Paul of old when the playoffs begin -- is there some chance he has been taking it easy? -- and proceed to demolish the competition en route to a deep postseason run. Furthermore, there's hope that his knee will heal more fully by next season, whenever that begins. In the meantime, we have to accept that he is now a different kind of incredible than he once was. That might not make him MVP, but it may still make him one of the best point guards of all time.